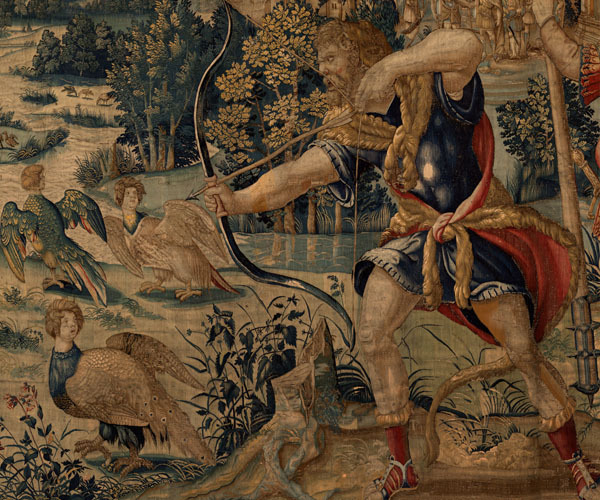 Six tapestries from The Labours of Hercules are currently displayed in the Royal Palace of Madrid; the set was originally composed of twelve. Mary of Hungary, the governor of the Netherlands and sister of Charles V, acquired them in 1535, paying 1,512 pounds to the weaver and merchant Willem Dermoyen. On her death in 1558, the tapestries were bequeathed to her niece, Juana of Austria, Princess of Portugal, and then on Juana’s death they were passed on to her brother, Philip II. 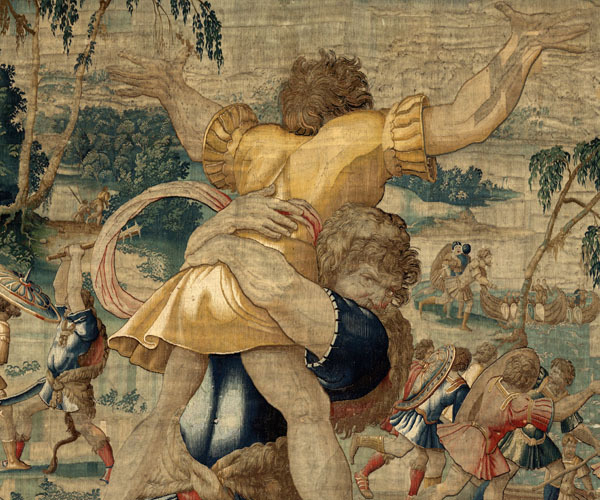 The six tapestries in Madrid, made of silk and wool, are the oldest extant series about the Labours which Hercules was forced to perform. 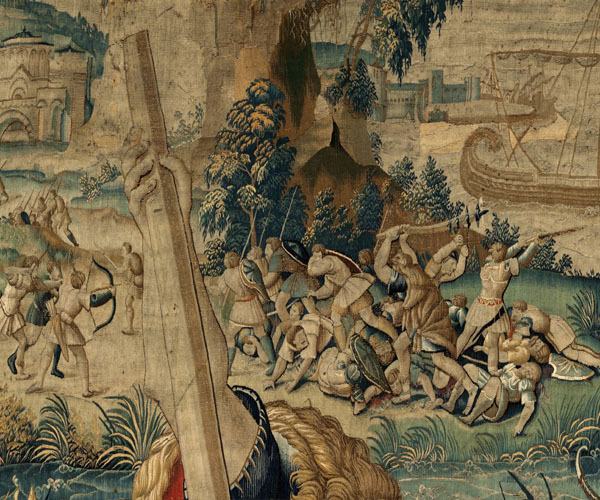 The existence of all twelve tapestries is recorded until 1751, at which point four had become so worn that they were discarded. At a later, unknown date, another two suffered the same fate, leaving only six surviving to this day. Hercules – Heracles in Greek – was the son of the god Zeus and the mortal Alcmene. Hera, Zeus’ jealous wife, decided to punish the son of her adulterous husband by driving him into a fit of madness. In his madness, Hercules slew his six sons and two of his nephews. After recovering his sanity, Hercules retreated from the world and eventually was challenged by the oracle of Delphi to perform ten labours imposed by his hated enemy Eurystheus. Hercules began the arduous task, occasionally accompanied by his nephew Ioalus. As a result, the number of labours was increased by two, because Eurystheus refused to accept both the slaying of the Lernaen Hydra (in which Hercules’ nephew had helped) and the cleaning of the Augean Stables. 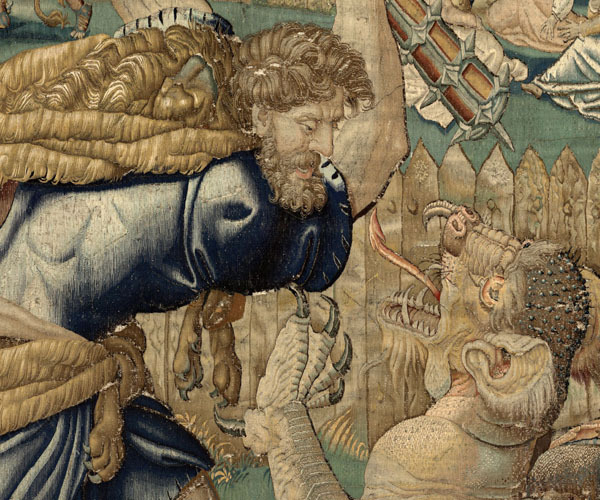 These two stories are not to be found in the six preserved tapestries. The other episodes not preserved are those of the Nemean Lion, the Erymanthian Boar, the Ceryneian Hind, Hippolyta’s Girdle, and the Cattle of Geryon. The episodes from the Twelve Labours which have survived to the present day are those about the Stymphalian Birds, the Cretan Bull, the Mares of Diomedes, the Apples of the Hesperides and Cerberus. 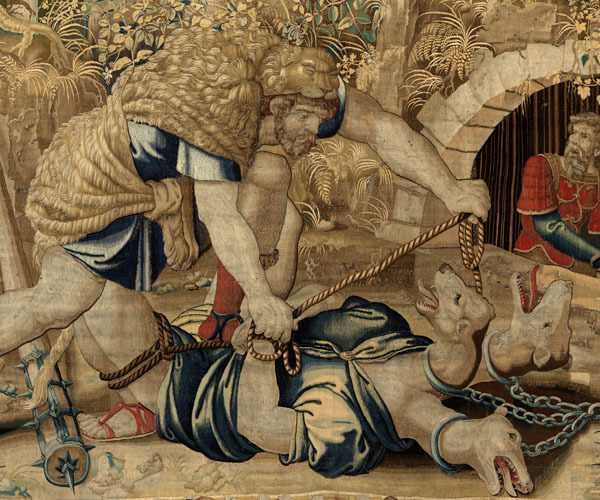 To this we must add the tapestry of Hercules killing Antaeus, which properly speaking is not one of the Twelve Labours imposed by Eurystheus. 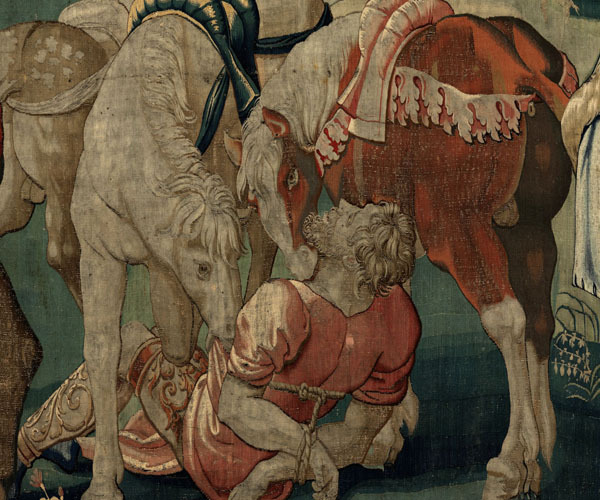 Mary of Hungary bought the cycle from Willem Dermoyen, although the monogram which appears in several tapestries has sometimes been interpreted as that of Jan Ghieteels. The Catholic Monarchs owned cloths with the story of Hercules, a character who personified virtue. Members of the Spanish Habsburg dynasty came to identify themselves with the hero, so much so that Charles V was occasionally referred to in propaganda as the “Spanish Hercules”. However, the series does not allude directly to the Habsburgs, indicating that they were only acquired after the series had been finished. P. Junquera de Vega y C. Herrero Carretero, Catálogo de tapices del Patrimonio Nacional. Volumen I: Siglo XVI, Madrid, 1986, pp. 155-162. G. Delmarcel, Flemish Tapestry, Nueva York-Londres, 1999, p. 364-365. F. Checa, Tapisseries flamandes. Pour les ducs de Bourgogne, l’empereur Charles Quint et le roi Philippe II, Bruselas, 2008. (Ed. en español, Tesoros de la Corona de España. Tapices flamencos en el Siglo de Oro, Bruselas, 2010), p. 194.